Rambo 4 - Stallone's Blockbuster Workout! If you saw Rambo I and II, you would have noticed how Stallone's physique changed between the two movies. Here's the training and supplementation program that Stallone used as he prepared for Rambo IV! How many of you have ever spent countless hours on the internet, searching: "How do I get a body like Brad Pitt's in Fight Club?" I'm sure you got an answer, but it may not have been the one you were looking for. The answer is countless hours of cardio combined with a paltry diet of nothing but small portions of lean meat, and cigarettes. Not to mention, Brad Pitt has excellent genetics. How many of you came away from watching Rocky Balboa, talking more about Sylvester Stallone's body than the plot of the movie? I thought so. If you're not a fan of the super lean, arguably scrawny look, I present to you a hypothetical account of the weight-training, supplementation, and nutrition plan Stallone used for Rambo IV. 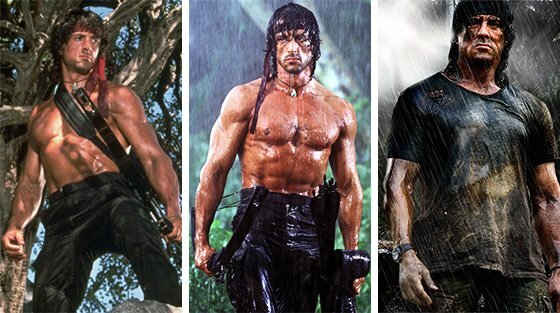 If you saw Rambo I and II, you would have noticed how dramatically Stallone's physique changed between the two movies. He was unquestionably far more ripped in the second one, thanks to the rigorous training of renowned Franco Columbu and his implementation of a double-split routine. That's right folks; Sly put in a decent amount of work into his physique, it didn't just come to him naturally. Chances are, undo-able for many other men his age, 61, he utilized the double split routine again for Rambo IV -- 6 days a week, two times a day (including cardio). Using anywhere from 8-12 reps and 3-4 sets, resting minimally between sets and exercises in order to keep his heart rate up would be the best program to rip up on short notice for a movie such as this with maximal weight for the rep-range. Remember, Sly is a machine; there's no such thing as a "light day" with him. With someone of his age, it's a difficult task to try to burn fat AND build muscle simultaneously, which is why he would have to work at maximum effort all the time. Cardio would be done 5 days a week on an empty stomach for 30 minutes in the morning, with a heart rate approximately 65-85% of his max, and again in the evening for the same amount of time with the same heart rate. Although he's considered a senior citizen in many countries, with proper supplementation, nutrition and rest, this double-split program would not have been too incredible a feat for Stallone to pull off. Here are some great supplements that are best used to create a body that still draws attention from people world wide. When working out continuously at maximal effort for so long, a physical toll is taken on the body and cortisol is built up. BCAAs help reduce cortisol. They also keep insulin levels normalized so that Sly wouldn't get too hungry between meals while he was dieting. Lastly, BCAAs have an anabolic/anti-catabolic effect on muscle. Protein powder is generally consumed immediately after exercising, or in place of a meal. Having sufficient protein intake allows for efficient growth and repair of muscle tissue. Whey protein is the most commonly used type of protein. It contains high levels of all the essential amino acids not produced by the human body, and is absorbed by the body very quickly. Sly's usage of this supplement would prove beneficial because his body's natural glutamine levels would have been depleted during anaerobic exercise (ie. Super-intense weight training, or cardio completed at a high heart rate). It is argued that bodybuilders should supplement with glutamine, as deficiency may lead to a weakened immune system and wasting of muscle tissue -- something Sly would not have wanted. Not every 61-year old can have a solid 6-pack; some need a little help to keep the fat burning and the metabolism revving. Thermogenics increase the metabolism of the body's adipose tissue, generating heat. For the human body to perform at its maximum potential, it must be fed a vast and complex array of vital nutrients. Becoming deficient in just one of these essential vitamins or minerals breaks down the metabolic pathway that produces optimum efficiency, and performance declines. If Sly was training so intensely on low carbohydrates, then chances are, he was depleting his body of essential vitamins and minerals. Just as Stallone's training might have been similar to a bodybuilder's pre-contest routine, so would his diet. His carbohydrates would be high enough that he could function normally and continue to shoot the film, but low enough that his body was continuously burning fat. His fats would be kept moderate to low so that they could be used as his primary energy source to ensure fat burning. And finally, his protein would obviously be kept extremely high so that his body wouldn't start to burn hard-earned muscle. In finishing, if you want to look like John Rambo, you have to train, eat, and supplement like John Rambo. At 61, Sylvester didn't take any shortcuts, or play any games with his health or his physique, and neither should you. So consult your doctor before undergoing a rigorous training/nutrition/supplement program as this, and make sure he/she gives you the O.K. If all is well, and you want to be a buff action hero... 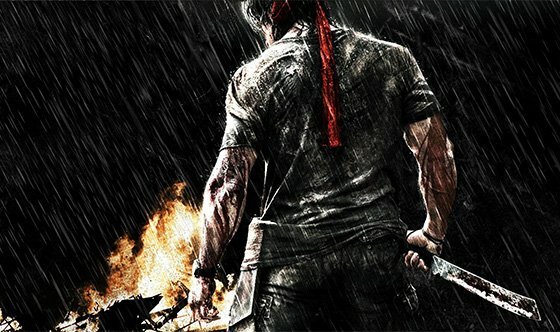 IT'S TIME TO GET YOUR SWOLE ON... RAMBO STYLE! Sylvester Gardenzio Stallone (born July 6, 1946) is a two-time Academy Award-nominated American actor, director, producer, and screenwriter. One of the biggest boxoffice draws in the world from the '70s to the early '90s, Stallone is an international icon of machismo and Hollywood action heroism. He is responsible for creating two characters who have become a part of the American cultural lexicon: Rocky Balboa, the no-name boxer who overcame all odds to become a champion, and John Rambo, the courageous soldier who specialized in violent rescues and revenge. Stallone has established himself as both a dramatic actor and one of the greatest action stars of all time. During the 1980s, he enjoyed phenomenal popularity and was the biggest movie star in the world with the Rocky and Rambo franchises. Stallone's culturally influential films changed pop culture history and he has largely enjoyed a career on the Hollywood A list for over 30 years. He is considered by many (including the mayor of Philadelphia) as the one who made the city of Philadelphia an international tourist attraction with the Rocky Steps. His incredible popularity there has led to a statue of his Rocky character being placed permanently near the Philadelphia Museum of Art as a cultural landmark. On August 2007, a statue of Rocky was also erected in the Serbian village of Zitiste. His film Rocky has also been inducted into the National Film Registry as well as having it's film props placed in the Smithsonian Museum. Stallone did not gain world-wide fame until his starring role in the smash hit Rocky (1976). The film was awarded the 1976 Academy Award for Best Picture. On March 24, 1975, Stallone saw the Ali-Chuck Wepner fight which inspired the foundation idea of Rocky. That night Stallone went home, and in three days he had written the script for Rocky. After that, he tried to sell the script with the intention of playing the lead role. Robert Chartoff and Irwin Winkler in particular liked the script (which was suggested by Stallone after a casting), and planned on courting a star like Burt Reynolds or James Caan for the lead role. The final result was an unequalled success; Rocky was nominated for ten Academy Awards in all, including Best Actor for Stallone himself.